One Note Ahead: Ozzy Osbourne, '60s Pop Star? Ozzy Osbourne, '60s Pop Star? Was Ozzy Osbourne a member of The Magic Lanterns? Here are the facts: The Magic Lanterns were from Warrington, England. During the late ‘60s, their personnel included a bass player and singer named Mike “Oz” Osbourne (also spelled Osborne), who was featured on “Shame, Shame” and other Magic Lanterns recordings from 1968-69. Many music critics and historians have since claimed that Mike “Oz” Osbourne and John Michael “Ozzy” Osbourne are one in the same and record dealers have often sold the Lanterns’ 1969 LP Shame, Shame as an early effort by the Black Sabbath frontman and solo superstar. Ozzy himself has always denied being a Magic Lantern, but there is no shortage of music lovers who refuse to believe him. Ozzy’s fans have plenty of responses to charges that he was in The Magic Lanterns: Ozzy’s from Birmingham, not Warrington. Black Sabbath were already active, under the names Polka Tulk (or Polka Tulk Blues Company) and Earth, before and during the period when Ozzy was supposed to have been plucking away at his bass as a Magic Lantern. And for that matter, when has Ozzy Osbourne ever been a bass player? In addition, this webpage includes detailed personal recollections from The Magic Lanterns’ own Alistair “Bev” Beveridge, who mentions Mike Osborne [sic] but never says a word about Ozzy. This paragraph seems compelling at first, but it raises a few questions. Exactly what record company confirmed the identity of the Lanterns’ bass player? The UK branch of CBS Records, to whom The Magic Lanterns were originally signed? Atlantic Records in the United States, for whom the band recorded the Shame, Shame LP? Or was it another label entirely? Also, one must only look at a map of England to see some problems with The Magic Lanterns being Ozzy’s side-gig during Black Sabbath’s early history. Warrington is close to Manchester, which is in turn a considerable distance from Birmingham. Marymont claims that The Magic Lanterns “ventured down to London in the mid-‘60s,” but if we operate on the premise that the Lanterns were based in London during the “Shame, Shame” era, we must also take note of the fact that London is no closer to Birmingham than Manchester. If Ozzy was already in a band in Birmingham, why would he take such a long trek to play in another band as a side project? It’s possible that Ozzy felt he wasn’t advancing quickly enough in the music business, took up the bass, traveled a long way to live a second life in a commercial pop group with a UK chart entry (“Excuse Me Baby”) under its belt, and then denied having any involvement in said band after he became famous. It’s just not particularly likely. A voice in The Magic Lanterns might sound like Ozzy’s because a latter-day listener is casting about for proof that the Prince of Darkness really was in that band. 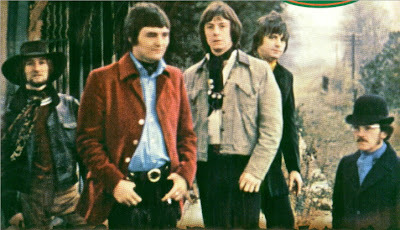 As for the Ozzy lookalike in the Lanterns’ photo, let’s face it: Ozzy Osbourne does not have a distinctive face. His overall image is what makes him easy to identify. => “Shame, Shame” and other early Magic Lanterns tracks were arranged by John Paul Jones, soon to become the bass player for Led Zeppelin. This is not surprising; during the 1960s, Jones was a highly prolific arranger and, like his eventual bandmate Jimmy Page, an in-demand session musician. => Later Magic Lanterns recordings (post-Mike Osbourne) included Albert Hammond, the singer/songwriter responsible for ‘70s soft rock favorites like “It Never Rains In Southern California” and “The Air That I Breathe.” Hammond co-wrote a number of Magic Lanterns tunes from the early ‘70s, including their small US hit “One Night Stand.” Hammond’s son is the appropriately-named Albert Hammond, Jr. of The Strokes. => The Magic Lanterns’ only UK chart entry, “Excuse Me Baby,” was written by Artie Wayne, a legendary mover-and-shaker who has done everything and then some in the music business. His website is here and his entertaining blog can be found here. => “Shame, Shame” was co-written and originally recorded by American singer and songwriter Keith Colley, best known for his own regional 1963 hit “Enamorado.” He and his wife Linda wrote several songs that ‘60s rock and pop collectors know and love, such as “Shame, Shame,” “One Track Mind” (The Knickerbockers), “Playgirl” (The Knickerbockers, Thee Prophets), and “Mindrocker” (Fenwyck, The American Breed). Colley’s demo version of “Shame, Shame” is available on his Mindrocker compilation, but the 45 version remains a rarity. All those ties plus the allure of Ozzy Osbourne’s alleged membership? Not bad for a typical-sounding pop band that would probably have been forgotten otherwise. Original text copyright © 2007 S.J. Dibai. All rights reserved. I once had an Ozzy bio from the 1980s that, in fairness, didn't even mentioned The Magic Lanterns, but did include a photo of Ozzy playing a bass guitar (even if he was just posing!). Listen to the track titled "I Don't Wanna Go To Sleep Again" from "The Magic Lanterns Shame Shame" album. It's clearly Ozzy on lead vocals. IT IS OZZY! Fantastic! I looked for evidence of Ozzy playing bass and couldn't find it. I've even seen discussion forums where fans of his said that Mike Osbourne couldn't be Ozzy because Mike was a bass player. Thanks, Ayrton. ozzy did not play on ALL Magic Laterns material. only the last LP. I have the sole Canadian LP of the magic laterns, on Polydor records, all tracks feature Ozzy, , and the back cover of the Canadian Pressing, shows A VERY Distinctive Ozzy. C'mon..beyond that, the proof is just the sound of his voice on record. It's not a stretch if you consider the music industry in england in the 1960's. It's pap, that's why he denies being in it! and being credited as Mike "OZ " osbourne..how many omens do you need? haha ;) This ain't a sabbath, but it's an interesting document anyways. Nice! One thing I like about this blog is that people have more info to contribute can indeed contribute it. Thank you! 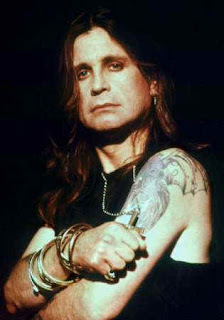 I can clear this up straight away.Mike Osbourne or 'Ozzy. was a bass player from Lymm,Warrington,Albany road infact.He played with lots of Warrington Bands in the 60's,then had a lucky break,after being with Ron Pickards's bands,and joined the Magic Lanterns.He was with them for 2 years or less >> then, if I remember,joined 'Ken Knight and The Midnite 4,replacing Kenny Krank.I joined this band in the early 70's,along with terry skidmore on drums,so the line up was Ken knight vocls and trumpet,Ozzy on bass and vocals,me on lead guitar,and vocls and terry skid on drums.We eventually disbanded mid 70's.Ozzy went back to pipe fitting, lost a son in a tragic road accident in Warrington,remarried,and I rejoined him and Warrington drummer Billy Fog,in a trio,playing at the Spar brook,Warrington, Walkers Club,etc, etc.We all fizzed out in the 90's,due to old age.but I.m still playing, so Rock on !! Another example: when the Rolling Stones promoted "Let's Spend The Night Together" on the Ed Sullivan TV programme, they were asked (ie, forced) to sing "Let's spend some time together". Mick Jagger always denied this, saying "I mumbled, 'let's spend some 'mmmmmmm' together'" - but the advent of VHS and bootlegs of the programme in the 1980s proved him, er, wrong. Ozzy was never in the Magic Lanterns and if you truly believe he was, you're totally daft. These are the same twits who insist The Knickerbockers sound like The Beatles...yes they do, but only if you are tone deaf. "There is a fellow in the Magic Lanterns' photo who looks like Ozzy"....LOL, now who could that be? He looks like....Toulouse Latrec! LMAO! In that picture above, the guy second in from the right looks a lot like Ozzy, don't you think? Absolutely! Listen to "Impressions of Linda" and the use of the word "now" at the end several lines. Classic Ozzy! I've been exploring for a bit for any high-quality articles or blog posts in this kind of house . Exploring in Yahoo I finally stumbled upon this web site. Reading this information So i am satisfied to convey that I have an incredibly just right uncanny feeling I found out exactly what I needed. I so much indubitably will make sure to don?t disregard this site and give it a look on a relentless basis. a very different way. 5 hour battery life you aren't going to find anything that lasts longer on one charge and is still able to offer a full range of applications and net connectivity. While the Inspiron and Samsung both offer the new i3 processor, the Acer AS5253 comes with a quick AMD-E series 2. Excellent, Mark! Especially now that the Bev Beveridge interview I linked in my article has disappeared. Thanks for sharing!